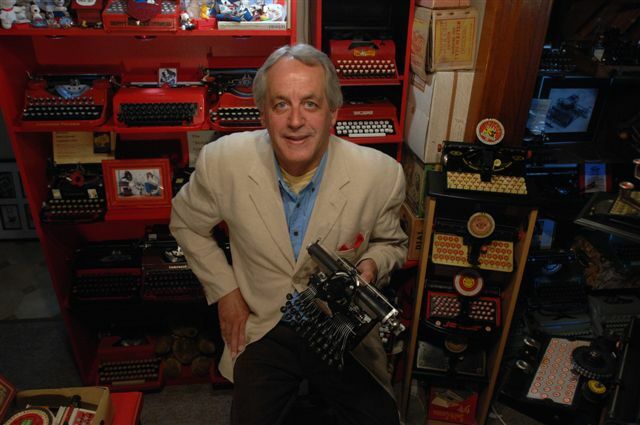 On this day in 1955, Heinrich Schmitt (born 1927), of Frankfurt, was issued with a US patent for his Schmitt Express Bakelite portable typewriter. 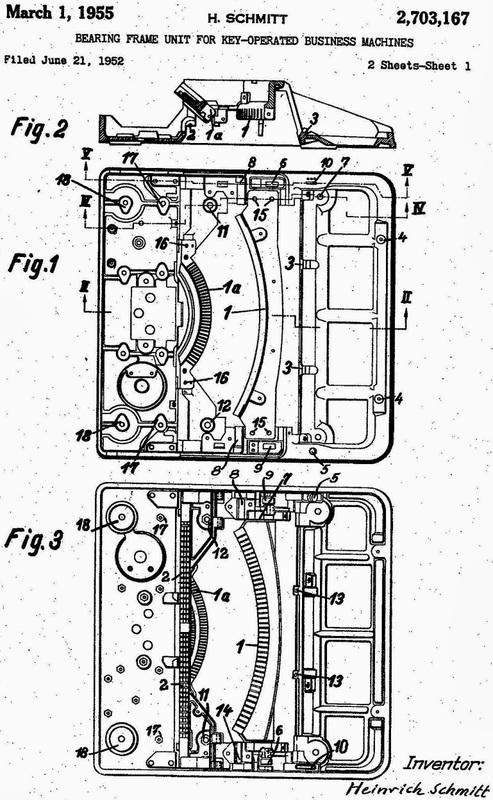 The patent was assigned to Rudolph Wittich, but the machine itself says it was made by Schmitt KG. I have seen claims that the typewriter was actually manufactured by Merz of Frankfurt (although Merz ended production of its own typewriters in 1939). Wittich inherited the company Wittich Fertigungstechnik GmbH which Franz Wittich had started in Kamnitz, Sudetenland, in 1918. The business relocated to Bavaria and set up shop in Atzmannsricht. At the time of Schmitt’s typewriter design, it had been re-established to manufacture “rubber vehicles” in Gebenbach. In 1955 Wittich, still based in Frankfurt, himself took over development of the Bakelite typewriter. Schmitt had first applied for a patent in Switzerland in June 1951, and the machine was first produced in 1952. See my blog posts on the Express here and here. In his application, Schmitt wrote, "An object of the invention is to make the bearing frame complete with all bearing points entirely as a plastic pressing, the required mechanical strength and dimensional accuracy of the pressed parts being suitably provided for. A feature of the invention is that the plastic bearing frame is adapted to a vertical layout (that is, in the direction of working pressure) of all bearing and guiding surfaces, without overlapping, in such manner that local accumulations of material or undesirable changes in cross-section are avoided. Another feature is that all the journal and pivot bearings as well as the guiding or bearing surfaces form a statically coherent part of the frame and that the latter is made entirely of a hardenable impact and bending resistant, plastic material in a single pressing operation. Yet another feature is that the bearing points are essentially under-dimensioned, and that transition members in the form of webs connected with the casing walls, are provided to equalize the stress in the direction of the least moment." I've heard of the bakelite typewriter before but never knew it was designed so all the bearing points would also be bakelite. I wonder how many sold and how long they lasted. In many ways I think had the machine been metal and the body bakelite it may have out done the Japanese with their plastic body machines. Many plastics are much more forgiving of bumps, bends and drops though than brittle bakelite.